Today I want to go to Daintree village, and knowing that it’s only 33km away via the bitumen road makes it sound very doable. Before I can leave, I need to repair my bike as much as I can. I’m not feeling that motivated to take the front wheel apart and replace the broken spokes, so I procrastinate a fair bit. This caravan park is so full of people, something I have never seen before. There are people camping in the parking lot, and they have allocated camping spots where they’re not supposed to be. 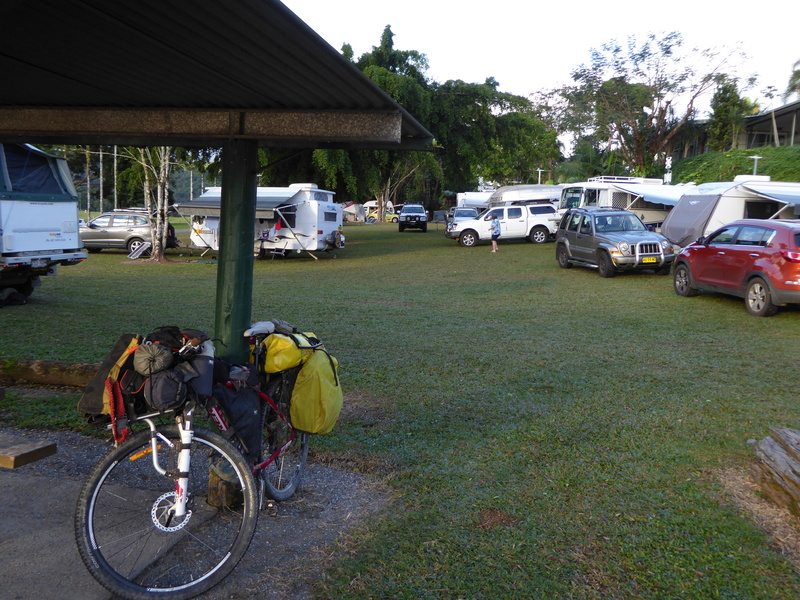 Mossman is the last town with supplies before Cooktown, and in between there is the Bloomfield track that can’t be done with a caravan. So many of the caravans have to stop at Mossman. The town itself is an interesting mix, white local people, indigenous people and travellers. As opposed to Port Douglas which has just become a huge holiday resort complex. In Mossman you can still find cheap meals amid a few trendy Cafes. When I’m about to finish repairing my front wheel and truing it as best I can with the little experience I have, something comes to my mind. I forgot to check whether there was a bike shop in town. I did see a sign yesterday but it looked like the old remains of a bike shop that had closed down ages ago. A quick google search indicates it might still exist. I have no hope to find a new wheel there, but I could get help truing my wheels. Just before noon I get to the bike shop. The owner is busy helping a lady repair her prawn. I think this is the place where everything that has wheels and no engines gets fixed. The old man has a look at my front wheel, on which I replaced two spokes and tells me it’s looking good, nothing to do. It’s lucky because I was just randomly tightening and loosening spokes until it looked better. I’m glad I decided to learn how to do that before departing, it’s such a useful skill. As for the back wheel, as I’d expected he does not have a spare one in stock. In fact his stock, on the wall, makes his shoop look like a bike museum. Old pedals, old bikes, dust everywhere on everything. He agrees to check my back wheel and true it despite the unrepairable damages, but I would have to come back at 2pm because now he has to go to the bank and have lunch. So I wait, pack up, prepare everything and have a big meal at the cheap take away restaurant. He works on my back wheel and advises me to carry less gear. I ignore him more or less. I just ignore advice whenever I don’t want it. As soon as I leave I notice my front tire is pretty much flat. I must have pinched it in the morning. So I go back to the shop to replace the tube and use the compressor. We have a good laugh as he expects me to come back once again in five minutes with another issue. 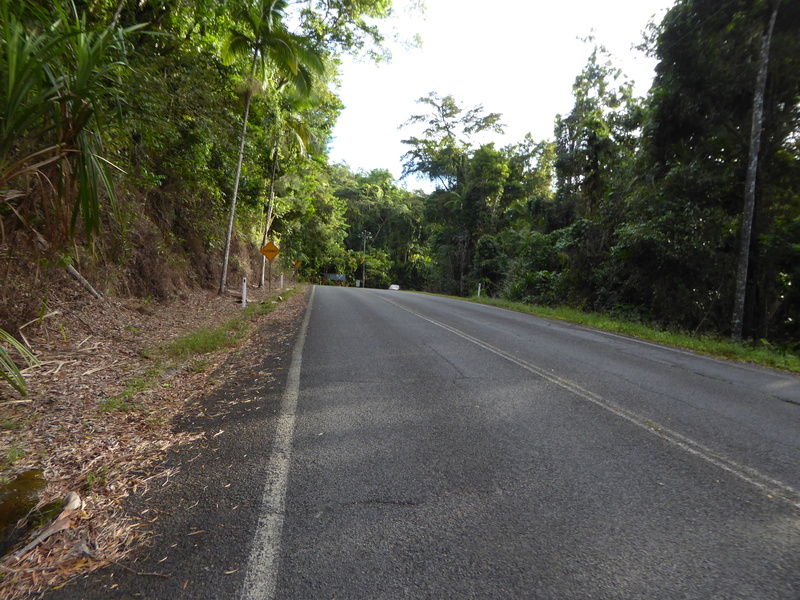 Finally I’m off to Daintree, and indeed it’s a dangerous ride. The road does not always have a shoulder and there is a lot of traffic. I still don’t understand how someone can enjoy riding a pushbike on the road for days or months on. It is such a stressful experience to me. The silver lining is that if I ride on the road, I don’t risk getting bushed. I will be in Daintree in less than 90 minutes. This is a relief, compared to spending an entire day trying to do it in the bush, failing at it, and having to come back. That ordeal cost me a lot of damage to the bike and two days of travel time. I also hit a low mentally. 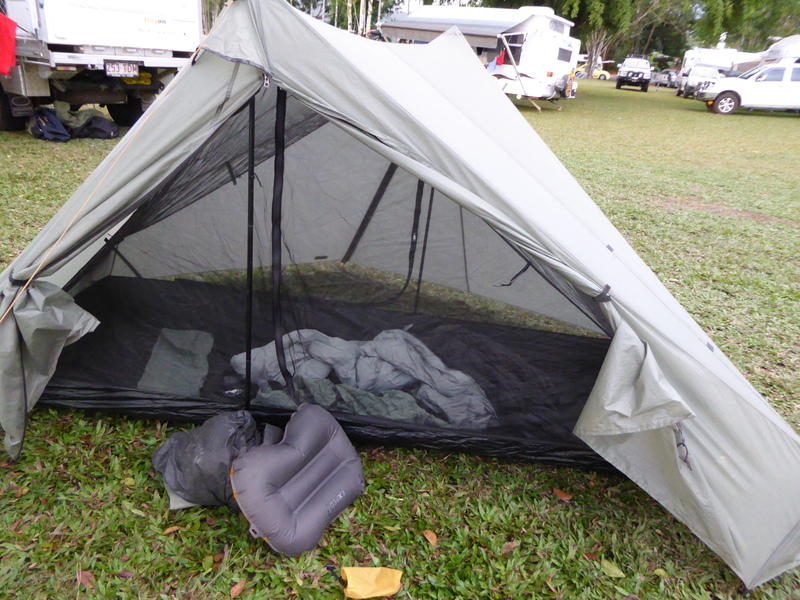 Fortunately I’m smiling again, and the excitement of being in Daintree soon is working. Once I arrive in Daintree I don’t recognise anything. 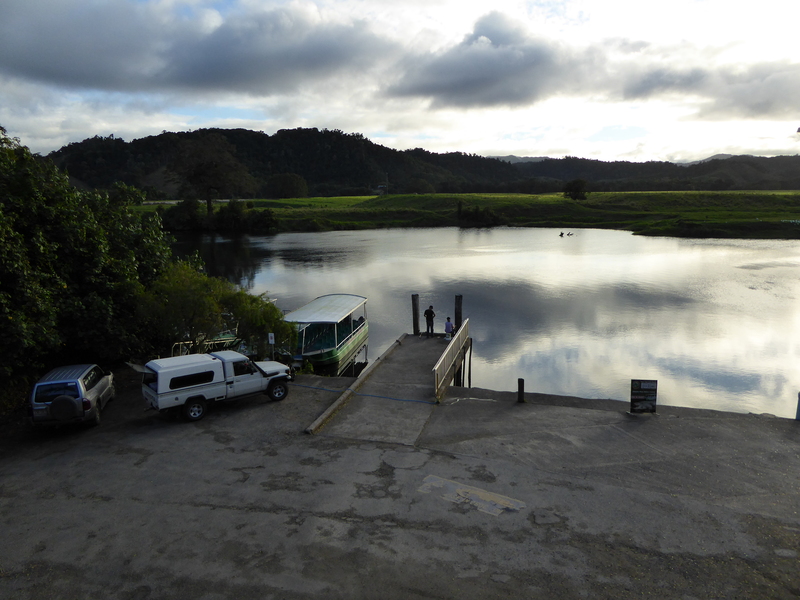 I came here four or five years ago and only remember the camping ground and the croc spotting cruise on the Daintree River. It’s only once I’m actually on the camping ground that I recognise it. The main difference is that it’s packed with people, and not raining as much, though a little bit. As I’m walking there, someone stops me and says he recognises me. This person happens to have read my blog a few times and left some comments on Facebook. I didn’t know that would ever happen. At last, just before the trip is over, I seem to have a few followers. It is a very pleasant surprise. Tonight I laugh silently when I see two girls, backpackers, sunburnt and about to cook a good serve of instant noodles. Can’t really do better than this for cliché. Although the group of French backpackers are not bad either. I present that I’m not French, and remain incognito, but listen to them talking about the weather. They are sick of the rain and wonder if it will be a good experience snorkelling at the great barrier reef in the rain. I’m tempted to explain it’s called rainforest here for a reason, but I let it go because I didn’t know better than them not long ago. It’s also part of their experience to slowly learn about the specificities of the local climates. 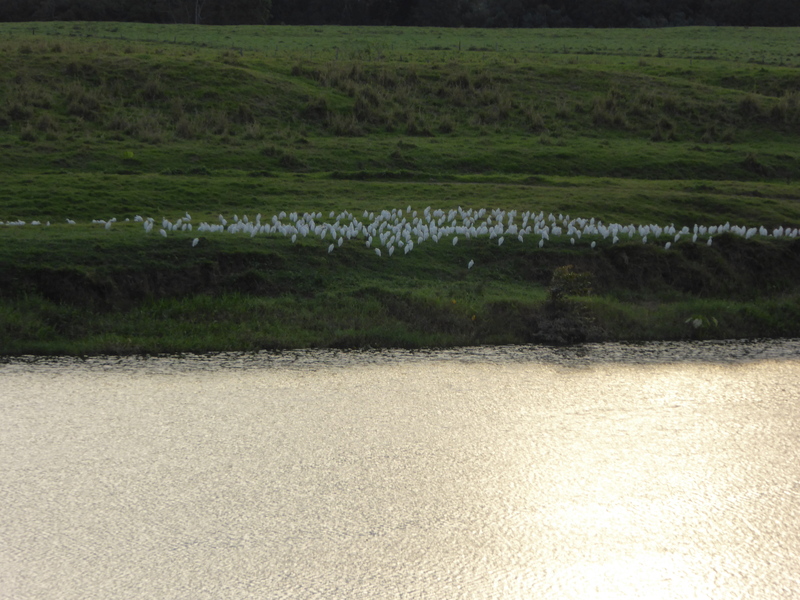 As I sit by the Daintree River, a few things are keeping my mind busy. Should I cross the river by foot tomorrow? Will the bike hold itself together until the end of the trip? 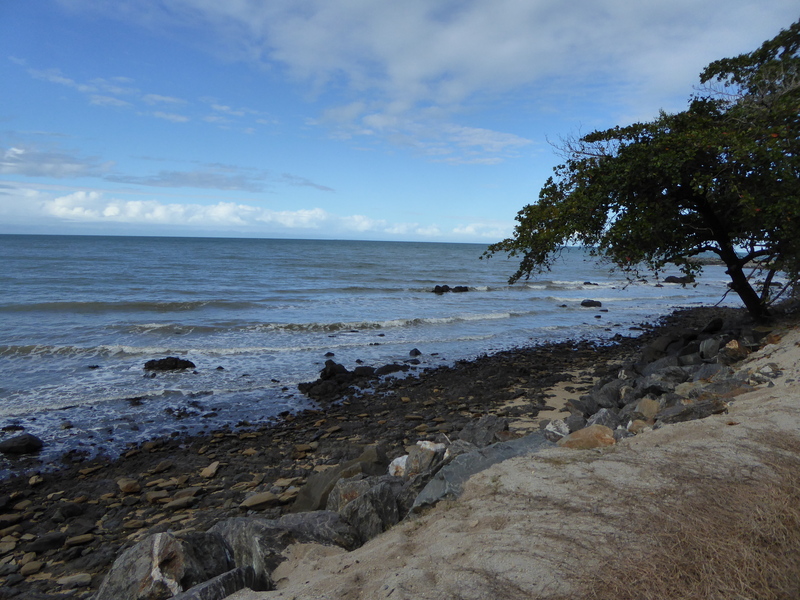 Should I stay here one more day or try to make it to Cooktown before I relax? How will I get from Cooktown to Cairns? So many questions that don’t really need an immediate answer. Tomorrow is another day, and some rest will make things a lot clearer. I have 135 kilometres to go, of which 72 are on a bad track, and seven days left before fly out to Europe. I need to get the timing right. As much as I want to rest, it’s not easy until I feel like I can really afford it.